New Laundry Basket Beauties! Come and see what else is new for Fall at Corn Wagon Quilt Co. Helping my son with some of his first high school homework, I was intrigued by one of his English class assignments. He was to shown the cover of several books in a variety of genres and was asked to describe in three words what the tone of the book might be based on the cover art. Loving books as much as I love quilts (don't they go hand-in-hand? ), I was surprised that I had never heard of any of them. We had fun coming up with words to describe our first impressions and it was cool to see how similar our guesses were as to the tone of each work...playful, romantic, dark, suspenseful, energetic, mysterious... I spent the following day at work, preparing the shop for new fall arrivals and displays and I couldn't help but take note of the "tone" of each new quilt. I started playing the same game of describing each work of art in three words... fresh, sunwashed, sweet, delicate, energetic, mysterious... each quilt had it's own flavor, feeling and message. What tone are the quilts you are currently working on? Do you tend to pick projects of the same flavor or do you enjoy a broad palate? Two of my favorite new quilts in the shop are both by Edyta Sitar of Laundry Basket Quilts. Edyta is a talented designer of innovative quilt patterns steeped in tradition. Her fabric designs for Moda include colorful batiks and classic prints alike in blending color tones that create a feel that is both classic and unique. Hope Chest was pieced and appliqued by Marianne Michaels using Laundry Basket's Something Blue collection. How would you describe it's tone in three words? 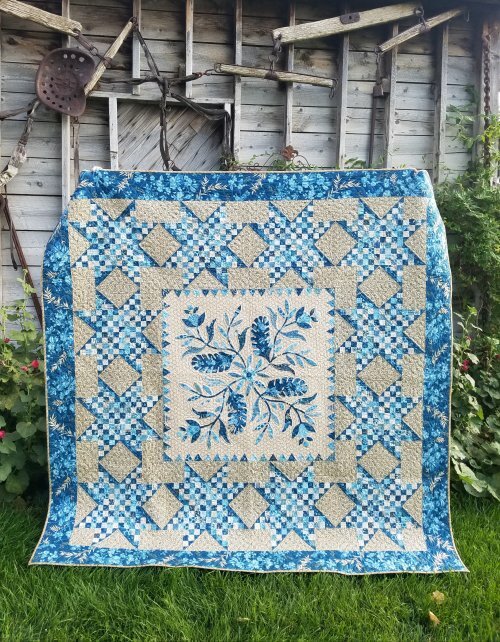 Made in USA, pieced by Chris Chamberlain, blends two of Edyta's collections, Something Blue and Little Sweetheart. While both quilts use the same fabric styles, each has it's own tone - - both beautiful, don't you agree? We currently have THREE lovely collections by Laundry Basket Quilts! Top to bottom: Sequoia, Little Sweetheart and Something Blue. We also have kits for both quilts shown above! Edyta Sitar's creations are always some of our favorites. Check out her blog to learn more about what inspires her beautiful designs and follow what's up and coming. Chances are, you'll be seeing more from her here at the shop! Our Fall Open House is coming right up in early September and with it our new Fall Class Schedule! Here's a sneek peek at one of the classes being offered. 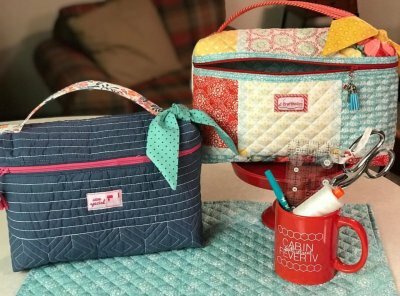 Shannon White will teach you how to sew up this easy pouch pattern using a store-bought, quilted placemat as your fabric! Half the work is done before you even begin. Made in just a few steps with personality and style! Early sign-ups exclusive to our email subscribers, are available now on our website. $20 Class Fee. Join us here at the shop, Thursday, September 27th at 6:00 p.m. for this fun 3 hour class! 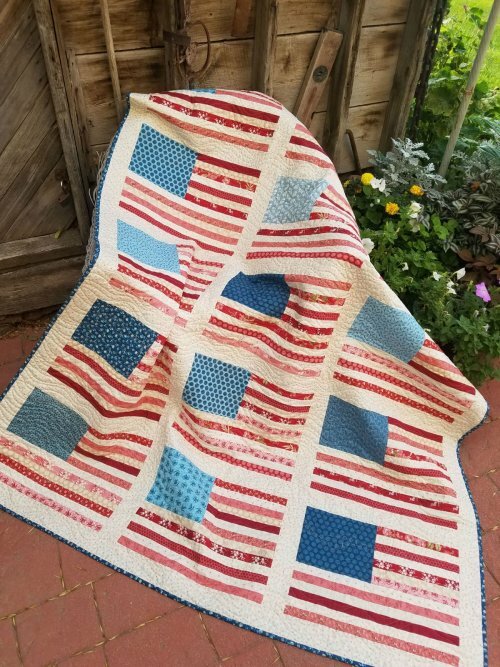 Corn Wagon Quilt Co. will be CLOSED Monday, September 3rd for LABOR DAY! Instead of a Marvelous Monday we'll have a TERRIFIC TUESDAY SALE! September 4th - 25% off KITS including all regular price quilt kits, hemstitching kits and select wool kits! UFO 2-Day Retreat - Still space left for you and a friend! Friday, September 7th 10 a.m. - 11 p.m.
Saturday, September 8th 10 a.m. - 7 p.m.